I truly can not live without this product, I have purchased it over and over again and will continue to do so. 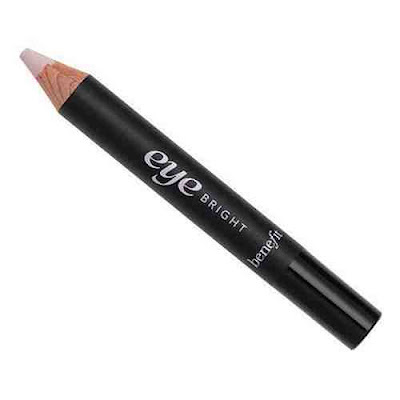 Eye Bright is a light pink fat pencil that brightens the eye area for a wide awake look. I use this under my eyebrows, on the inner corners of my eye, under my eyes, waterline and sometimes the bridge of my nose. One pencil lasts me about 5 months, which is pretty good going! I particularly enjoy using this when I'm trying to avoid wearing heavy makeup, I don't like to use a powder highlighter on my eyes if I'm not wearing eyeshadow - so this is perfect. It has a creamy texture, that is easily blended with fingers. It's so versatile and the fact that I don't need to use a brush, is a bonus! This is most certainly one of my HG staple products I use every day! Have you used this? If so, what do you think about it and have you found any dupes for it? i use a similar pencil to this, but it's by Anastasia--I'd love to compare the both of them now! I don't think I have even heard of the benefit eye bright, I will have to check it out when I'm next time im in town. wow! is it available on INTERNET shopping sites? Yeah I agree the texture of this is lovely. Muhsine - I went on Illamasqua website today, and registered. When they asked me where I heard about them from, I put the link of your blog up ;) Hopefully they'll reward you somehow, huh? lol. My mum uses this and has done since it first came out. I love multi-purpose products!!! I recently did a review on this and I LOVE it!!! It is one of my favorite multitasking products! I have tried this, and personally I prefer the Anastasia of Beverly Hills highlighter pencil in "sand"...it is a bit more shimmery and less chalky than eye bright.